This Saturday will see the return of a New England duo who have been bringing their own brand of delicious folk music to the region for 25 years. 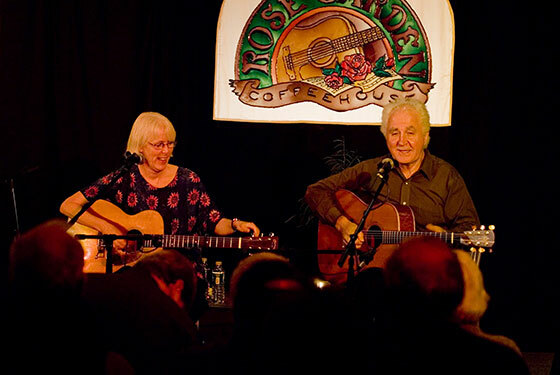 The reign of folk mastery by Steve Gillette and Cindy Mangsen matches perfectly with the Rose Garden Coffeehouse in Mansfield, as it celebrates its 25th anniversary season. Gillette and Mangsen have been performing and recording together since their marriage in 1989. They first appeared at the Rose Garden 20 years ago, when the shows were held in a small building called the Rose Garden located behind St. Mary’s Church. Since that time, Gillette and Mangsen have grown musically, bringing their endearing music, steeped in harmony and intricate guitar and concertina work, to audiences everywhere. And the Rose Garden eventually settled in the Congregational Church, across from Mansfield’s South Common. Steve Gillette began writing songs in the ’60s, and his music has been covered by Ian & Sylvia, John Denver, Garth Brooks, Linda Ronstadt, Tammy Wynette and many others. But his own performances unveil the true feelings behind his songs, his warm baritone and tenderly chosen guitar notes adding unique inflections. Indeed, he even has an unusual finger-picking style, as he plays with a flat-pick and two fingers. Steve’s song “Darcy Farrow” has become something of a rite of passage for aspiring singers and guitar players and has been covered by dozens of other artists. His solo album, “Texas and Tennessee,” was named one of the Top Ten Folk Albums of the Year upon its release. He has conducted songwriting workshops all over the US and Canada, and is on the Board of Directors of the Kerrville Folk Festival. He is author of the book “Songwriting and the Creative Process,” a standard text in songwriting groups. He also has many duo albums (with Cindy Mangsen) available. Cindy Mangsen is a musical tour de force, known for her interpretations of traditional ballads, as well as for her own songwriting. She plays guitar, banjo, concertina and mountain dulcimer, and whether she leads or follows, Mangsen is Gillette’s perfect match, her vocals a seamless blend with Gillette’s. Mangsen has recorded several solo albums (“Songs of Experience” received the Editor’s Choice Award from “Crossroads”), as well as collaborations with Gillette, Priscilla Herdman, Anne Hills, and Michael Smith. Her latest solo album, “Cat Tales,” is devoted to “songs of the feline persuasion.” Cindy has led singing and ballad workshops at the Augusta Heritage Center in West Virginia and The Woods in Ontario, Canada. To help observe the 25th anniversary, the Rose Garden will display a collection of gallery-quality photographs, taken over the years by Rose Garden resident photographer Steve Ide. Going back to 1991, these photographs show some of today’s well-known musicians performing in their much earlier years at the Rose Garden. Also, Rose Garden Artistic Director Mac McLanahan has assembled a collection of close to 75 folk, bluegrass, and acoustic music songs with the word “Rose” in the title. These songs will be played before each show and during intermission this season. The Rose Garden Coffeehouse volunteer staff will be serving home-baked dessert items and hot and cold refreshments in a coffeehouse atmosphere that calls up the classic 60’s coffeehouses of Greenwich Village and Cambridge. Doors open for the 8:00 p.m. concert at 7:30 p.m. and tickets will be available at the door. For more information or advance tickets, visit the Rose Garden website.